Marie was born on her parent’s farm [between Caltowie and Stone Hut] on March 9th, 1902, the 2nd daughter and 5th child of six born to Peter Traugott Zwar and his wife Caroline Wilhelmine Wandke. Her grandmother Magdalena Zwar was the midwife, and in future years she would always bake a birthday cake for her grandchildren and take it to Church on the Sunday to pass on to her grandchildren. Marie was welcomed as a child of God through Holy Baptism in the Pine Creek Lutheran Church near Appila, South Australia on March 30th, 1902, where she also made confirmation of her faith in the Lord Jesus on November 28, 1915, under the guidance of Pastor Adolf Ortenburger. In later years Marie remembered how her grandfather Peter Zwar would lift her down off the buggy by her head when she was a little child! Marie attended the Pine Creek Lutheran School. The Zwar children were taken to school by Nellie – an old horse – and the children sitting on a flat dray. From home they took a short cut across Lange’s paddock and then went via the Almond Tree corner, picking up up several Lange and Wurst children on the way. The journey with old Nellie took about two hours. When the government closed the Lutheran schools in South Australia during the first World War, the Zwar children went to the Stone Hut public school, about eight kilometres, but a shorter journey than it had been to Pine Creek. At first the Zwar children had difficulties at their new school as they couldn’t speak English! 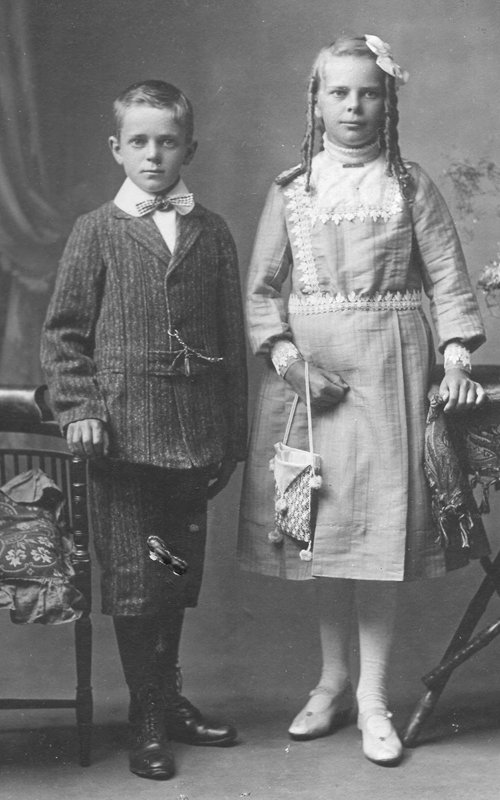 Their parents, Peter and Minna, always spoke German at home. Marie completed her education at Stone Hut. Albert Nayda lived on their farm as a farm worker for many years. He never married. The children liked him. He used to help them with their schoolwork. After completing her schooling Marie took confirmation lessons from Pastor Ortenburger for half a day each week, usually on a Tuesday or a Friday, depending on which day suited him. 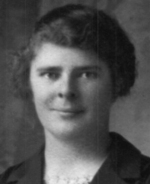 Marie was confirmed in the Pine Creek Lutheran Church on 28th November 1915. Marie then helped on the family farm. At the same time they helped various families in the district as help was required. The girls had to help with farmwork too, like pumping the bellows in the blacksmith, and helping out with the harvest. “We worked stooking sheaves of hay, loading them, and carting the wheat,” Agnes and Marie told Kevin Zwar. “Father sent me to help the neighbour too because he was loading hay on his own!” (Marie). Marie learnt dressmaking at Nuriootpa from Miss Keller. She boarded with Laura Borgas at Ed Zimmermann’s home for about the three month’s the course took. Marie worked for a time at Alf Becker’s. Some days she also went and did housework for her grandfather Peter Zwar in his final years and after he had lost his wife – he lived to 93. “Our first car was bought in 1924, a Buick 4, and father drove it, and no one else for quite a while. It was white. We now had to drive to Church via Staker’s Corner as it used to get too wet for the car on the flats over to Langes”. A highlight of the year was the Church Picnic, held in the early days down from the Lutheran Church near the Pine Creek crossing. They did their shopping at Laura, where Agnes and Marie took music lessons on the organ from Mary Dack but soon the teacher moved away and lessons ended. In time Marie met Herbert Johann Schultz. was born Feb. 18th 1906 at Wilmington, the third son of seven children of Julius and Anna Schultz (nee Scheibner). He was baptized in his home on Nov. 18th 1906, and confirmed his faith in the Lord Jesus Christ on December 5th 1920 in Holy Trinity Church Appila by Pastor Adolf Ortenburger. Herbert grew up on his parent’s farm at Hammond near the town of Wilmington, where he went to school. The farm was a mixed one, combining sheep, cattle, and wheat growing. In 1921 the family moved to the Laura area. His parents Julius and Anna are both buried at Holy Trinity Lutheran Cemetery Appila. 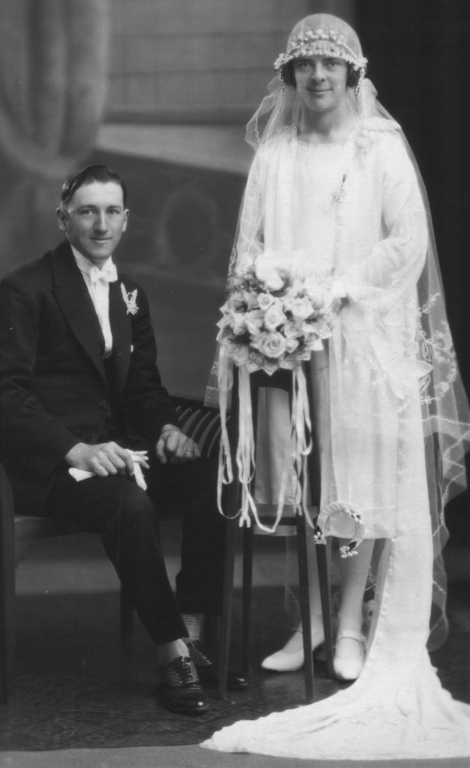 … [Verna Fiedler].The couple were married in the Pine Creek Church on August 3rd, 1927. The ceremony was conducted by Pastor Ortenburger. Wedding Breakfast was held in the barn shown here in the background on the Zwar home farm. 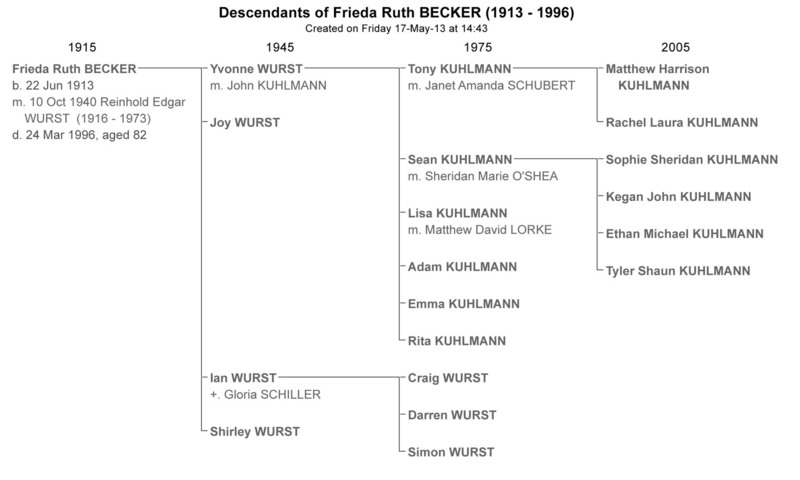 In 1948 Herb and Marie were able to buy their own home and land on the Laura Blocks quite close to Grandfather Peter Zwar.“ [Gladys Schild nee Schultz]. In 1946 they moved to what would become their family home, on the banks of the picturesque Rocky River on the Laura blocks. “Herb continued his farming work as well as other sideline activities, like growing vegetables for the local green grocer, operating a dairy and providing milk for Golden North Factory, and serving as a wood merchant. Dad farmed his own land as well as share farming for the Kennedy, Wurst and Hincks families. During those times Marie was always at his side, helping with the farm work and preparing food for the family, also supplementing the family income by rearing hundreds of turkeys which ended up on the Christmas dinner tables of many folk in the community.“ …Verna Fiedler. 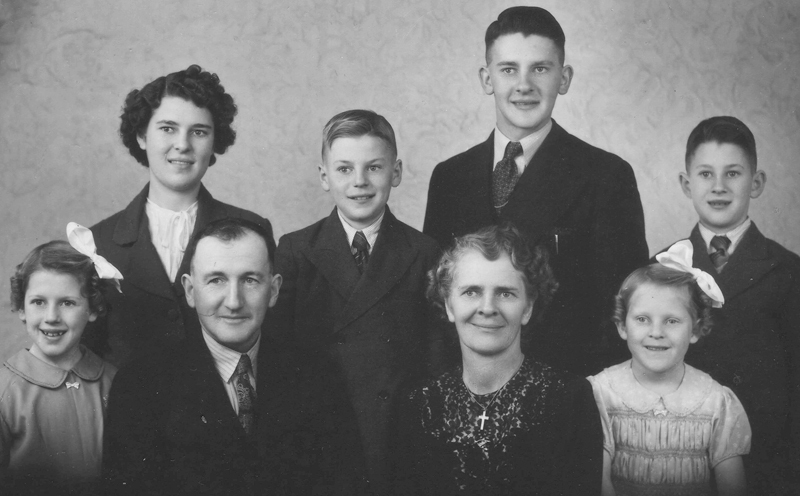 Marie and Herb Schultz nurtured 6 children – Ken, Gladys, Maurice, twins Glen and Verna, and Myra. “Every Friday night after school the kids were given a treat, which was either a halfpenny water ice block or a penny milk iceblock from Mattiskes shop in Laura Main Street. One day the two youngest girls Verna and Myra thought they would get some shorts on appro from the Eudunda Farmers shop in Laura. And when they paraded with them on in the kitchen, that did not go down well at all, as it was a disgrace to show their legs like that. The shorts went back the very next day.“ … Verna Fiedler. “Dad involved himself closely with mission activities in his congregation, caring for the church property, as well as serving as treasurer of Men’s Fellowship for many years. He endeavoured to share the word of the Lord by supporting financially many missions. In January 1987 he was awarded a certificate as Life Member of the Bible Society.” … Verna Fiedler. “We recall our time in the family home with deep affection. Our mother was blessed with the gracious gift of hospitality and there was always a generous variety and supply of food to nourish family and friends – especially with her noodle soup and cakes. She won various prizes for her baking in the local shows and supplied cakes and butter to local residents. Mum specialised in baking ‘Kuchen’ (German cake) and in 1978, at the age of 76, she won first prize with her ‘Kuchen’ in the Tanunda show. Competing with the Barossa skills was quite an achievement. We also recall that when the foxes, rabbits or crows were around our mother was a good shot with the 12 gauge – at one stage aiming for one crow and dropping two. Kenneth and Mona Schultz have memories of their Dad and Mum. Marie lost her husband in 1987. Herbert died April 7th 1987 at the Booleroo Centre Hospital at the age of 81 years. Marie spent her last 13 years in the Tanunda Lutheran Rest home until her life came to an end at the grand old age of 99 years and four months on July 13th 2001. All other members of her generation had predeceased her. Like her father Peter Zwar she lived to see four generations. Marie was farewelled in the Pine Creek Lutheran Church near Appila and laid to rest alongside her loving husband in the cemetery next to their Church and the School she had attended.